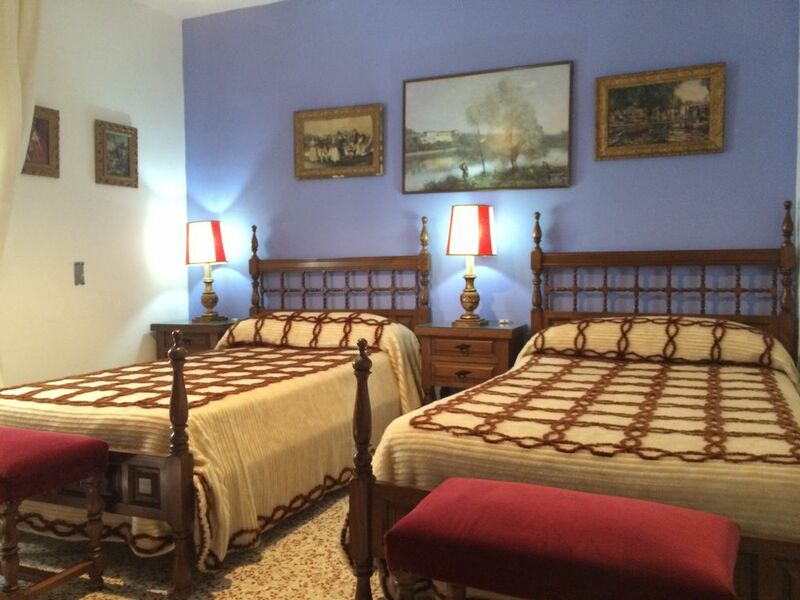 Holiday home for rent Breakfast with 6 seats located in Sierra Mágina (Pegalajar, Jaen) to enjoy the taste of the old in an old farmer's house, restored to offer a different, relaxing, cozy and surrounded by comfort experience. The house, former home of farmers, recently restored, is a cozy space, reminiscent of old, singular times, in short, which has respected the old structure, but completely renovated using for it materials like stone, wood and metal , for maximum comfort. It has been decorated using antique furniture restored mostly by ourselves. Its thick walls help maintain a constant temperature, although we have technological support, air conditioning and heating in all rooms. In the living room are available fireplace, sofas, TV, video, Hi-Fi, dining area ... sure you spend a good desktop, the warmth and good conversation !! Plants, mini-garden, overlooking the courtyard fresh air, certainly a place to share good times. The smells of wet earth, vegetation, relax and cool summer nights. Currently we have three double bedrooms (two with double beds and one with double bed) 3 bathrooms, one on the ground floor, two bedrooms shared (green and blue) and another integrated into one (attic) one. The total capacity is designed for six people. The village is 5 minutes walk, there you will find all the essential services: outpatient, pharmacy, church, bus stop, sports center, public swimming pool, supermarkets, shops, etc. In Mágina there are many paths and mountain trails where you will find magnificent scenery to enjoy nature, photography and have peace of mind to rest. Do not forget your camera, you would take as a souvenir stunning scenery! • Enjoy "tapas", traditional cuisine and drinks in bars, restaurants and pubs of Pegalajar. • Visit the mills of the village (oil mills) to buy first hand and without intermediaries our pure olive oil "extra virgin" and see their development process. -Úbeda And Baeza (40 km), heritage cities of humanity. -The People of Sierra Mágina, with its peculiarities and unique beauty: Cambil, Huelma, Bélmez de la Moraleda, Bedmar, Jimena, Torres, Albanchez de Mágina, etc. Normally, we are in the house for guests, informing them about the area or helping them with whatever they need. Children (under 5 years) who sleep in the same bed with their parents, free. pets not allowed, kitchen not available. Not allowed access to people outside the reserve. Smoking in common areas (living room and patio). Smoke-free bedrooms.